You want to travel full time but are concerned about keeping up with life’s documents while away from home. 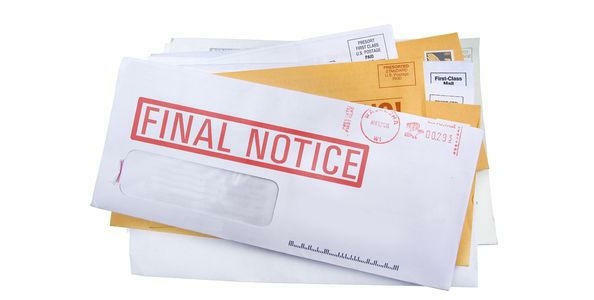 These documents can be bills, bank statements, insurance policies, etc. I’m the first to admit it’s a challenge. I’ve been traveling all my working life and fortunately with advances in technology and services, it’s much easier today than it was twenty years ago. I no longer have to rely on friends, neighbors, or even my parents to check my mail and tell me what I have and don’t have. Back in 1999, I started thinking about what it would take to become independent with documents and correspondence and not rely on anyone at home while traveling. I tried different things and approaches, but nothing came together until ten years later. In 2009, all the pieces fell into place with the availability of new technologies and services. It still takes planning, discipline and being open to trying new ideas and services. But, it’s still much easier today than it was when I started. Here’s how I got started and continue to keep up with my life’s documents and correspondence while traveling full time. They are many ways and tools you can use to organize your digital files. I prefer the computer operating system method for filing my documents while others recommend and use Evernote. Don’t get me wrong; I love Evernote, but I use it to capture and record those spur of the moment ideas. Evernote does provide an excellent electronic filing method, and you don’t have to worry about backup and synchronization, it’s built in. I use the My Documents folder on my laptop as a portable filing cabinet. I’ve created main folders called “Work Files,” “Home Files” and “Work Smart and Travel Files” for this website. 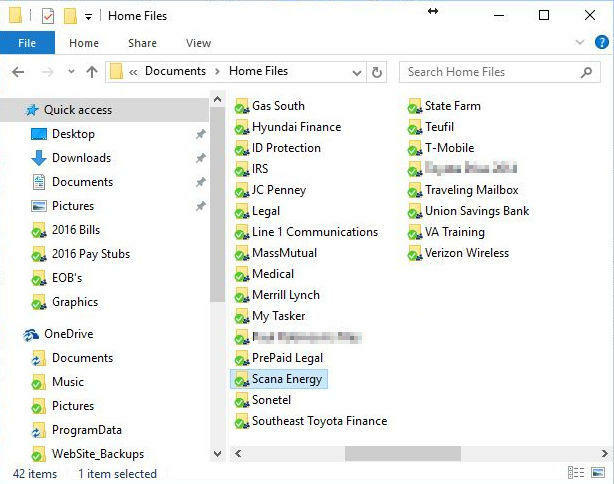 Under my primary Home Files folder, I have subfolders for banks and service providers. 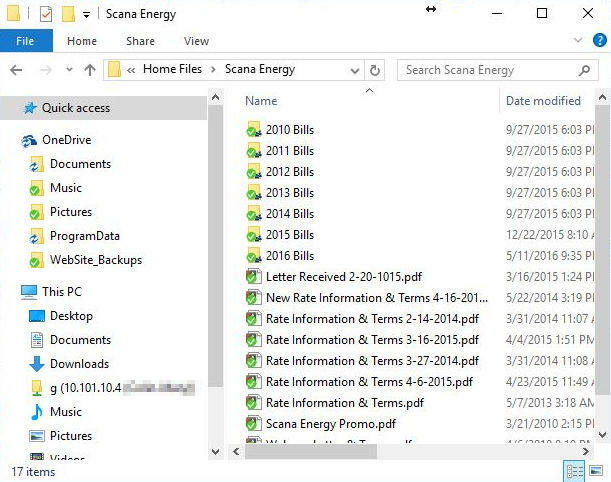 These subfolders contain files and other subfolders. 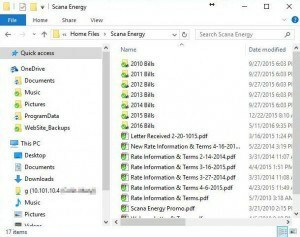 Let’s look at my gas company folder ‘Scana Energy’ as an example. In this folder, you see subfolders at the top containing my billing statements by year. Below this you see letters and rate information documents. The file format you store your documents in should be a forgone conclusion, PDF, Portable Document Format. It’s the most commonly used file format today and is cross-platform. Nearly all companies who send documents electronically, send then in pdf. You want to think about scanning your existing documents; you never know if or when you’re going to need them while traveling. I spent a weekend digitizing my old paper documents. But if you don’t want to do this boring task, there’re lots of companies who will scan your documents for you. Just Google “document digitization companies” and you’ll find loads. I digitized my paper documents going back three years. It depends on upon your age and personal circumstances as to how far back you go. I chose three years because the likelihood of anything coming up beyond this time frame was unlikely. Also, keeping bills this long gave me the ability to look at historical trends when reviewing service providers in case I need to make a change. To digitize my documents, I simply used the scanner on my Hewlett-Packard printer. I also used a program called PDF-Xchange Editor. PDF Xchange allowed me to scan documents, annotate and create custom stamps. One stamp I set up is a “Paid” stamp that I use to stamp my bills as paid. I then save the PDF file in the relevant folder. I chose PDF Xchange because of the features listed above, and the price was right. It wasn’t free! But it wasn’t hundreds of dollars neither, unlike some PDF editor programs. Have a good backup plan! 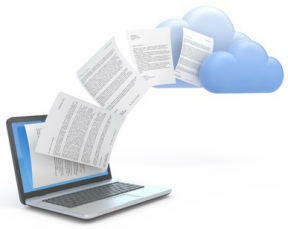 Now you have a filing method in place, the PDF editing software, and have scanned your existing documents. Next, you need a good backup plan. The backup plan or method you choose needs to be capable of backing up your existing files, and future incoming documents as well. Go with a cloud-based service for your backup. There’s two types to choose from, straight backup and synchronization. I prefer sync because they don’t only backup your existing files and data, they also synchronize your files with other computers that you want to use. For instance, all of my home documents are synced with my wife’s computer in addition to mine giving her access to these files as well. Any files she adds or edits are automatically synchronized back to my computer and vice versa. Two services I’ve used in the past are Dropbox and SugarSync. Currently, I’m using Microsoft’s Onedrive. Windows 10 has Onedrive built in, and with my Office 365 subscription, I have a whopping 1 TB of cloud storage. If you don’t have Windows 10 or an office 365 subscription, then I highly recommend you take a look at SugarSync. What makes SugarSync unique is its ability to work with your existing file/folder structure, and it doesn’t require you to keep data in a particular place, unlike DropBox and Onedrive. DropBox, SugarSync, and Onedrive, all allow you to access your files over the Web. Also, these three services have apps for your smartphone so you can access files and store files while on the go. A nice feature with SugarSync is its ability to recall up to five previous versions of a file, handy if you want to recall the original file after two or three edits. DropBox and Onedrive will only allow you to recall one previous version of an edited file. These three services I’ve mentioned have pros, cons, and different price plans. Check out each one and choose the right one for you. We now have a filing system, digitized our existing documents, and have a good backup/synchronization plan in place. Now it’s time to look at input channels for our new digital documents. New technologies and services have developed over the last 3 or 4 years that help with this endeavor. These services take the time and pain out of this endless task. I’ve also been able to adopt three methods and rules for importing new documents using these services. The services I use are FileThis, The Traveling Mailbox, Evernote, and TruboScan. The first method I use is for companies who bill and send documents to me electronically. The downside to them is that they all require you to log on to their Website to download documents. Fortunately, FileThis automates this task and saves you lots of time and effort. With FileThis, you set up connections to each service providers who provide electronic documents. Once the connections are established and depending on your plan, FileThis will check each connection either on a weekly or daily basis and deposits new PDF files to a destination of your choice. These include the FileThis Cloud, Dropbox, Google Drive, and the one I use is Evernote. I’ve setup FileThis to fetch and store into Evernote my bank statements, some bills, medical Insurance EOB’s, auto insurance premium notices, mortgage and investment statements. Unless I need to add or change a connection, I don’t think about FileThis as its fully automatic. The second method I employ is for companies who don’t send bills electronically or don’t have a FileThis connection. I have these companies send my bills, statements, and other correspondence through the mail to my Virtual Mailbox. The Virtual Mailbox service I use is called the Traveling Mailbox. With the Traveling Mailbox, I have a real street address, and not a PO Box. I prefer real street addresses because I’m not limited to postal mail only, I can receive UPS and FedEx packages too. A virtual mailbox is a service where someone checks your mail and notifies you when mail is received. You then login to your account online where you can see an image of the envelope. You decide what happens next to the mail piece. For bills and statements, I select scan and shred. A short time later I receive a PDF file of the contents, which I forward to Evernote. 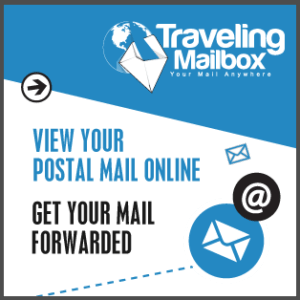 I prefer the Traveling Mailbox as my virtual mailbox provider because they integrate with Evernote, forward my packages and deposit checks to either my personal or business bank accounts while I’m traveling. The third method I use is for documents handed to me. I use an app on my smartphone called Turboscan. Turboscan uses my phone camera to capture a document image. Once captured, it automatically corrects the perspective ratio. I then save the document as a PDF file and send it to Evernote or Onedrive. Document Processing and paying bills. All new documents come into my Evernote’s default notebook. I renamed this notebook to “New/Need to file”. Once a week, usually on a Sunday, I will go through this notebook and file statements and pay bills. I have PDF Xchange editor set up as my default PDF program, so when I click on a PDF file attachment inside Evernote, it opens up in PDF-Xchange. I prefer using PDF-Xchange because it has more tools available for annotating documents than Evernote. For example, documents I need to sign and mail, I have setup a signature stamp for in PDF-Xchange. Once I’ve reviewed the document and paid the bill, I save the document to the relevant folder in Onedrive. Then I remove it from Evernote. Anything that requires further action or clarification remains in Evernote along with my notations until I have resolved the issue. On occasion, you will need to mail documents the old fashioned way using postal mail. The service I use is called PC2Paper. I use this service because they have both U.S. and U.K. mailing centers. Another service worth looking at is MailALetter. Both services are pay-as-you-go, and you need to keep a small balance in the account. You upload to these services documents in PDF or Word formats, key in the recipient’s address and pay the printing and postage fee. They will then print out your letter, stuff it in an envelope, stick a stamp on it and drop it in the mail. The only thing you can’t do is send checks with these services, but you have online banking for that. Use a good password managing tool. I use and recommend LastPass as my password managing tool. Lastpass uses a master password that is part of the encryption algorithm for all the other accounts and passwords you have stored. The only thing you need to remember is your master password. Without it, you will not be able to access your other usernames and passwords stored, and there is no retrieval method for forgotten master passwords. Not even Lastpass can retrieve it for you. But this service is secure, very secure. Use different passwords for different accounts, and never use the same password more than once. Ensure that your passwords are a combination of upper and lower case letters, numbers, and special characters. If you are using LastPass, then this is very easy for you to do. LastPass has a password generator tool that you can use to create passwords for each account you have. Where possible, use two-factor authentication. Two-factor authentication is the use of a password plus a second code. This code is sent via text message or is created by a code generator app on your phone. Google Authenticator is a good code generator app for two-factor authentication. In wrapping up what I have to say about security, I recommend you read my article Laptop Crashes When Traveling – 7 Tips to Help Recovery, it well worth the read and gives you additional tips. Sign up for as many electronic billing and statements from your service providers as possible. Sign up for a Virtual Mailbox service. Have a good backup/file synchronization plan in place. Use a good PDF editing program. As time goes by, they will be more cool services offered. You will find better ways of keeping your life organized while traveling full or part time. Whatever you do, please share your thoughts and findings here as comments for other readers.